Wales - Welsh Leagues Level 1-2 by grff Relink! Wales - Welsh Leagues Level 3-6 by grff Relink! Spain - Segunda B G1 SS'2018/19 by shooto Relink! Spain - Segunda B G2 SS'2018/19 by shooto Relink! Spain - Segunda B G3 SS'2018/19 by shooto Relink! Spain - Segunda B G4 SS'2018/19 by shooto Relink! Spain - Third Division Tercera Groups 1-18 SS'2018/19 by shooto Relink! France - Ligue 2 SS'2018/19 by Yoz Relink! Chile - Primera Nacional SS'2018 by shooto Relink! Crimea - Premier League SS'2018/19 by Jay_Jay_Max Relink! Holland - Eerste Divisie SS'2018/19 by Yoz New! England - English Leagues Level 9-10 SS'2018/19 by bolid74 Relink! Japan - J2 League SS'2018/19 by bktr_025 New! Germany - Regionalliga Level 4 SS'2018/19 by RuffRyder New! Germany - Lower Leagues Level 5 (NOFV-Oberliga) SS'2018-19 by Armamaddon New! Bulgaria - Second Professional Football League SS'2018/19 by karamel New! Bulgaria - Third League North-East SS'2018/19 by karamel New! Serbia - All Leagues Megapack SS'2018/19 by Serbian FM & Co Relink! Bulgaria - Third League North-West SS'2018/19 by karamel New! Bulgaria - First Professional Football League SS'18-19 by karamel Relink! Austria - Regionalliga Ost SS'2018/19 by schweigi New! Bulgaria - Third League South-East SS'2018/19 by karamel New! Bulgaria - Third League South-West SS'2018/19 by karamel New! France - Championnat National SS'2018/19 by Frimimout02 New! Rep of Ireland - League of Ireland Premier Division SS'2018/19 by SpGR New! France - Championnat National 2 SS'2018/19 by Frimimout02 New! Germany - Regionalliga SS'2018/19 by RuffRyder Relink! Germany - Regionalliga Level 4 SS'2018/19 Relink! Bermuda - Premier League SS'2018/19 by gianni1970 New! Bulgaria - Third League South-East SS'2018/19 by karamel Relink! Austria - Regionalliga West SS'2018/19 by schweigi New! Thailand - Thai League SS'2019 by OPZ New! Ukraine - Premier League SS'2018?19 by Jay_Jay_Max Relink! Lesotho - Premier League SS'2018/19 by gianni1970 New! Austria - Regionalliga Mitte SS'2018/19 by schweigi New! 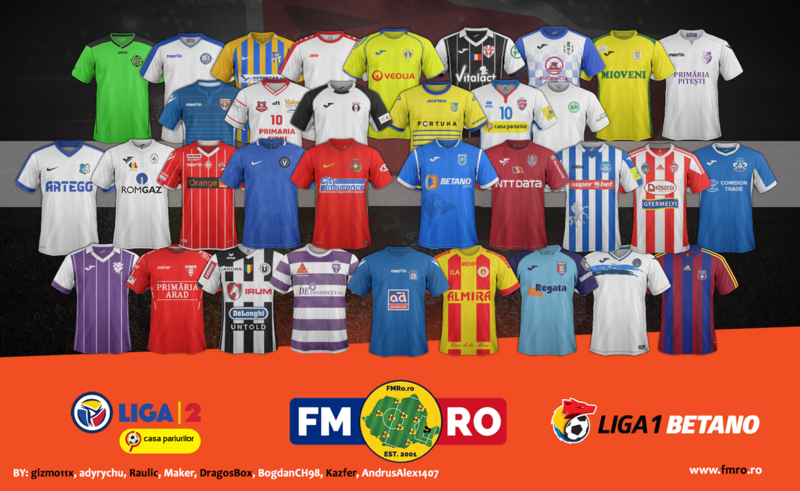 Romania - Liga 1-4 Leagues SS'2018/19 by ovidiu10 (fmro.ro) Relink! South Korea - K1 League SS'2019 by BabaFumika (FMNation) New! Poland - 1 Liga SS'2018/19 by cHMIELu Relink! South Korea - K National League SS'2019 by BabaFumika (FMNation) New! Rep of Ireland - Premier League Division SS'2018/19 by SpGR Relink! France - National 3 (Group E) SS'2018/19 by karamel New!